Personal optimization is about doing things not only better, but also faster. Not only with less resources, but also with higher quality. It is about getting the best results possible. If personal growth is about doing the right things, then this category is about doing things right. The tips in these topic could be practiced together with the tips from personal growth. There are many parallels between them. And the borders are sometimes not easy to define. To continue to the detailed post about personal optimization, click here. Practicing discipline and a daily routine is very important in order to get enough sleep and have enough energy to remain productive for the whole day. Everybody is struggling to get their day organized and optimized. You are all stretched between being an employee (or entrepreneur), a husband, a parent, a sibling and a child. And you also need to set aside time for yourself, pursuing education, fulfillment, relaxation and achievement. And on top of everything else and all your responsibilities, you have to find time to exercise and sleep. Practicing discipline can help you get hold of all those tasks. The key skills that I have found so far in my quest for perfection, is parallelization and organization. I believe that the best way to accomplish everything that you have to do in a day, is to do tasks in parallel. And the second most important task is to organize your day in advance so that you plan time for everything. Disclaimer: Use the techniques and the tips provided in this article at your own responsibility! Personal environment improvement through modelling your inner circle will teach how to review and model your closest friends in order to reach your goals. Personal environment means the group of you and your closest friends – aslo called inner circle. Modelling your inner circle (or letting go of certain friends) can be a rather controversial topic. Many people will describe it as cruel, bad or just unacceptable. Others would say that you are only taking advantage of your friends. But I believe that say you are a product of your closes friends. Your inner circle can keep you at your current level forever or it can propel you in space. After all, your closest friends listen to your ideas and share their ideas with you. You reach out to them for advise and they reach out to you with the requests. You recommend books to your inner circle and you read the books they recommend. If you are lucky enough you might also be brave enough to start a company together, or they can recommend you to join their companies. Personal optimization is about doing what you are doing better, faster, with less resources, with higher quality and with better results. 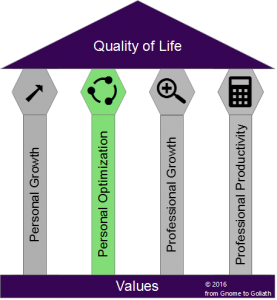 If personal growth is about doing the right things, then personal optimization is about doing things right.